Congress Vice President Rahul Gandhi arrived in Gujarat on Saturday on a three-day visit, his fourth in a row to the poll-bound state. 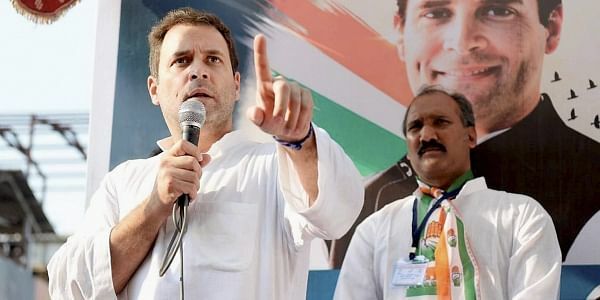 GANDHINAGAR: Congress Vice President Rahul Gandhi arrived in Gujarat on Saturday on a three-day visit, his fourth in a row to the poll-bound state. This time he is visiting the stronghold of the BJP, in north Gujarat. In Deesa, Gandhi will once again address small gatherings of youth and talk about Yuva Rojgar. On Sunday he will be visiting and having 'darshan' of two temples, one at Thara and the other Totana. He will also address a public meeting at the Thara ground. Late on Sunday evening he will arrive at former Chief Minister Anandiben Patel's bastion, Patan, and address a public meeting. He will make a night halt at Patan Circuit House. On Monday, Gandhi will meet Dalit leaders in the morning after his 'darshan' to Patan's Vir Megh Maya Temple. After that he will be visiting four villages in the area and once again have a small gathering and discussion (Chopal-style) with the nomadic tribe communities. On the last day of his three-day sojourn, Gandhi will have a 'darshan' in three temples. First in Varana, where he will also address a public meeting, then in Shankheshwar temple and later in Becharaji, where he will also address the 'Rojgar Adhikar Sabha'. Gandhi will arrive in the Mehsana constituency of Deputy Chief Minister Nitin Patel, where he will address women at 'Mahila Adhikar Sabha'. He will end the visit on Monday with small corner meetings in Visnagar, the place from where the Patidar reservation stir initiated. He will then leave for Delhi.